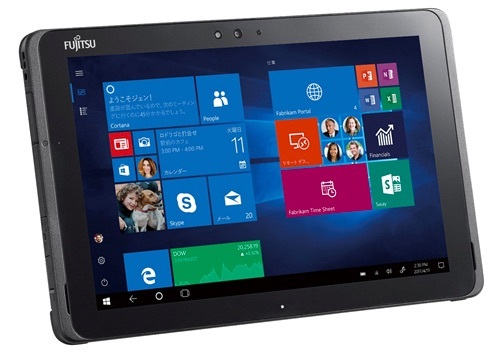 TOKYO, Jan 22, 2019 - (JCN Newswire) - Fujitsu Limited and Fujitsu Client Computing Limited today announced the launch of the Fujitsu Tablet ARROWS Tab Q509/VE, an education-focused Windows tablet, and the ARROWS Tab Q509/VB, an enterprise Windows tablet, as well as a number of enterprise PCs and workstations featuring the latest CPUs and the latest OS version. 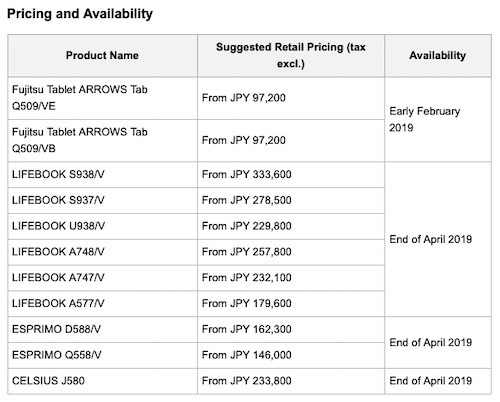 The new tablets are available for purchase in Japan from today. Fujitsu's new ARROWS Tab Q series tablets feature Intel Celeron processors capable of up to 1.9x the processing speed of previous models, delivering even higher performance while maintaining existing strengths, including exceptional durability, as well as water, dust, and chemical resistant functionality to provide users peace of mind These new models additionally have significantly enhanced high speed charging capabilities due to their increased charging voltage, making it possible to charge the tablets to about 80% in one hour, slashing charging time in half from the two hours of a previous model(1). This enables tablets to charge during short windows of time throughout the day, such as a lunch break, supporting smoother business operations and classroom lessons. The education-focused ARROWS Tab Q509/VE includes as standard a stylus pen that can be stored within the body of the device. The stylus has a hexagonal shape to provide a closer feeling to the pencils normally used in schools. Fujitsu's new models, including 6 LIFEBOOK notebooks across 3 product series, the ESPRIMO D588/V desktop PC, and the CELSIUS J580 workstation, come installed with the latest OS version, the Windows 10 October 2018 Update. In addition, the ESPRIMO Q558/V miniature desktop PC comes equipped with the latest Intel 8th generation CPU. With its latest improved offerings of Enterprise PCs and workstations, Fujitsu supports workstyle transformation by enabling mobile work through its comprehensive product lineup.